The Golden State Warriors have said that they aren’t concerned about seeding as the playoffs approach; that health is more important at this point in the season. But that doesn’t mean that they don’t want to win or are going to stand idly by when they feel like they lost because of the officials rather than the opposition. Of course, they have only themselves to blame after letting a 14-point halftime lead slip away. But some of the questionable calls at the end of the game didn’t help. Things started off well enough for the Warriors as they got out to a 32-27 lead after the first. They led by as much as 19 during the second but had to settle for a 14-point lead, 68-54, as the first half came to a close. The good times continued at the start of the third as the Warriors pushed their lead out to 19-points, 73-54. But then things began to fall apart. Minnesota outscored the Warriors 32-13 over the remained of the third to tie the game up at 86-86 heading into the fourth. The Timberwolves pulled ahead in the fourth and got out to a nine-point lead about midway through the quarter. 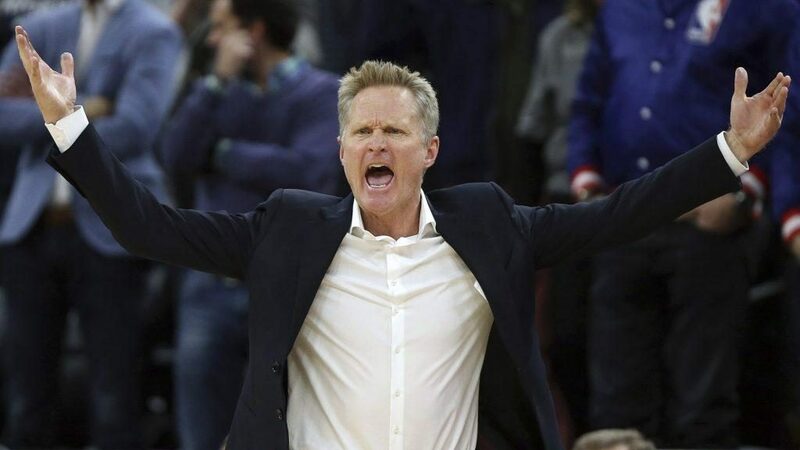 But a late 6-0 run by the Warriors tied the game up and sent it to overtime—which was where things took a turn for the worse for Golden State. Minnesota got off to a fast start in overtime and pulled ahead by nine, 128-119, with 1:41 to play. However, Steph Curry wasn’t done, yet. A couple of three-pointers pulled the Warriors within three, 128-125, with 23 seconds left. It was in the final seconds of the OT period that things got dicey with the officiating. A questionable foul all on Minnesota’s Keita Bates-Diop nullified what would have been a game-tying three-pointer by Kevin Durant with 4.4 seconds left. But then Steph Curry hit one with .8 seconds left to send the game to a second OT period– or so it seemed. On the ensuing inbounds pass, Anthony Tolliver appeared to throw the ball well over the head of Karl-Anthony Towns– Kevin Durant as still whistled for a foul. Towns then made one of two and the Timberwolves won, 131-130. The Warriors were not happy with how the end of the game played out. Steph Curry led the Warriors with 37 points and went 11 of 19 from three-point range. Durant scored 23, Klay Thompson had 20, and Demarcus Cousins chipped in 16. Andrew Wiggins led the way for Minnesota with 24 points followed by Josh Okogie with 20. Minnesota’s bench outscored Golden State’s 49-25. The loss is the Warriors’ fifth in overtime this season (0-5). The Warriors will look to bounce back when they host the Charlotte Hornets Sunday night. Minnesota will go for win No. 35 when they host the Philadelphia 76ers Saturday night.